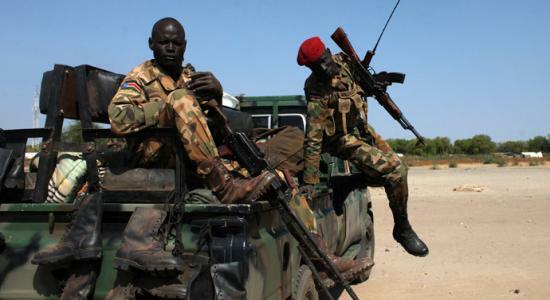 Armed rebels reportedly killed hundreds of civilians in a massacre that took place between April 17 and 17 in Bentiu, the capital of the South Sudanese state of Unity. The rebel forces were identified by the UN as Nuer people from the Sudan People’s Liberation Movement , led by former vice president Riek Machar. The assailants came under the guise of peaceful demonstrators intending to present a petition,” said a U.N statement. “Piles and piles” of bodies were left behind after the shootings, said Toby Lanzer, the top U.N. aid official in South Sudan. The bodies were in the mosques, churches, hospitals and in the streets leading to “a strong stench of decomposing remains filling the air, while vultures and dogs ate off limbs, scalps and abdomen flesh,” a report says. A split between President Salva Kiir and rebel leader Riek Machar led to a row between their supporters in December, last year. Since then one million people have lost their homes, around 800,000 of them internally displaced and 200,000 people seeking asylum in Kenya, Uganda, Ethiopia and Sudan. UN reports said that the rebel forces targeted people based on their ethnicity and religion, killing women, children, and the elderly and shooting the civilians who hid themselves and those who refused to join the Nuers backing the rebel forces. “There are so many that they’re being collected by bulldozers and dumped into mass graves. Accounts of the attacks shock the conscience; it’s an “abomination”, the White House said in a statement on Tuesday night.